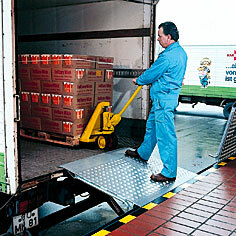 The Crawford Swingdock is the standard solution in general industry applications and easy to operate. The dock-in process has to be exact because of the defined length of the swing lip. The Crawford Swingdock system meets the standard demands of most loading operation and complies fully with all rules and regulations of the European Standard EN 1398. To enable a safe and efficient process for loading and unloading, the Swingdock connects the building with the vehicle. 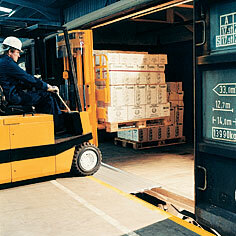 The result is highest safety for the transfer of goods, avoiding injuries to the personal or damages to the equipment. 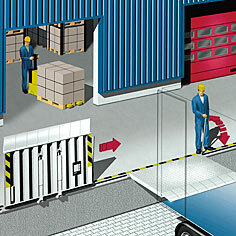 It is a time saving solution securing shortest possible ways in and out of the warehouse. For the optimal working environment the Swingdock is installed as a part of the complete loading bay consisting of a dock leveller, an overhead sectional door and a dock shelter. The operation of a Crawford Swingdock with steel or aluminum lip is based on an electro hydraulic swinging mechanism which bridges the last centimetres between the building and the vehicle bed. 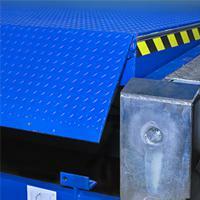 When the dock leveler is raised, the lip swings out and then when lowered lay down safely on the lorry bed. After loading or unloading, the leveler is raised again by the push of a button and automatically returns to its parking position, i.e. to ramp level. To enable the handling of vehicles with different widths, the swing lips are available in different configurations: square, shaped or with fold down segments. The lip of the Crawford Swingdock is made of steel and represents a durable and impact resistant solution and stands for long life time. Control Unit 950 series – the intelligent, all in one, docking control system. The Crawford 612 Unidock is a variable dock leveller adapter system and represents a cost-effective upgrade solution to replace obsolete dock levellers. Replacement time is short, and no building alterations are required. The application and mode of operation are as described for the 610 Swingdock and the Crawford 612 Unidock system meets the standard demands of most loading operation and complies fully with all rules and regulations of the European Standard EN 1398. See the Product Datasheet for possible options and sizes. The Crawford 615 Swingdock is the right solution for the handling of goods which require a higher load capacity of up to 10 tonnes (100 kN). The application and mode of operation are as described for the 610 Swingdock and the Crawford 615 Swingdock system meets the standard demands of most loading operation and complies fully with all rules and regulations of the European Standard EN 1398. The Crawford minidock is a manually operated dock leveler, specially developed for operators of fleets of standardized vehicles with the same bed height. It meets the demands of most loading operations and fully complies with all requirements of the European Standard EN 1398. The handling rod is equipped with a gas spring, making it easy for one person to operate it – just lift and swing the platform. The Crawford minidock design includes a limited, free-floating function, allowing the platform to adapt to the vertical movements of a vehicle bed during loading and unloading. The lip of the Crawford Minidock is made of steel. The shape of the lip is extremely flat and the design of the rear connection to the dock edge is bump-free, resulting in a smooth passage between building and truck bed. The Crawford teledock, i.e. the dock leveler with a telescopic lip, is the universal and most flexible docking system. It is suitable for every loading situation regardless of its complexity. The main advantage compared to other levelers is the movable telescopic lip which can be precisely positioned on the vehicle bed, thus giving optimal load utilization of the whole vehicle bed area. The Crawford teledock meets all possible user demands and complies with the rules and regulations of the European EN 1398 Standard. 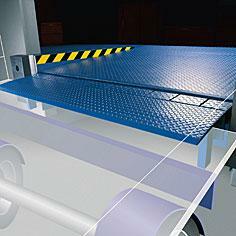 The Crawford teledock technology has optimized dock leveler systems regarding safety and user- friendliness. The Crawford teledock can be positioned on the vehicle bed with an utmost precision. Even inaccurately docked vehicles do not cause any problems. Retracting tongues provide flexibility for different vehicle widths. In its parking position the lip is under the leveler platform. The standard lip of the Crawford Teledock is made of steel. An aluminum lip is available as option. The aluminum lip is extremely flat, resulting in a smoother passage between leveler and truck bed. The result is that the chock loads for the human body as well as the bumps for the handling equipment are being reduced. This unique feature represents an ergonomic solution providing improved working conditions and lower operational cost due to less wear and tear of the handling equipment. The Crawford 625 Teledock is the right solution for the handling of goods which require a higher load capacity of up to 10 tonnes (100 kN). The application and mode of operation are as described for the 620 Teledock and the Crawford 625 Teledock system meets the standard demands of most loading operation and complies fully with all rules and regulations of the European Standard EN 1398. The Crawford drawbridge is the best solution for open ramps and for servicing vehicles of roughly the same size. The Crawford drawbridge model DMW is installed in a fix position, and the Crawford drawbridge model DMGZ is installed in a guidance rails placed in the front edge of the ramp. The latter alternative makes it possible for the leveler to operate in different ramp positions. When not in use, the drawbridge is secured in the vertical position with a safety lock. Both versions are steel constructions equipped with a heavy-duty spring device, enabling it to be conveniently lifted and lowered by hand. Hot dip galvanizing is standard to ensure corrosion resistance. The lip is a segmented aluminum alloy lip, compensating for sloping vehicle beds and facilitating smooth passages. The Crawford 643 Drawbridge PG is the alternative aluminium alloy model which completes this part of the leveller’s programe. It covers the needs for less load capacity and less working range, and this light version can also easily be handled by one person. 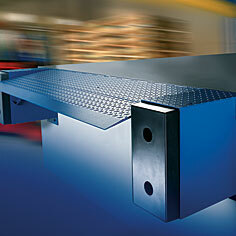 The Crawford mobile dock plates are the universal solution for all loading situations. In spite of their mobility, they are capable of handling heavy loads due to the special aluminium alloy material. Mobile plates can be used as a permanent loading solution or as an additional, back up capacity in case of unforeseen ramp bottlenecks. Automatic locking arms, safety hooks and full-depth lip heels give safe dock plate contact with the vehicle. For loading and unloading of railway wagons, the railroad operators have issued a number of rules that must be taken into consideration. One Crawford sliding dock plate is the right solution for this application. All the dock plates are made of a special, high performance aluminium alloy and meet all loading requirements and safety regulations.